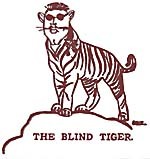 HE who bloweth the Whistle this issue and for some few ensuing issues is hight "The Blind Tiger." The name are too obvious for comment. Now is the time for all good men to come to the aid of the party! The quick brown -- never mind, never mind. Anyhow the Tiger could use contribs. Lottsa contribs! Great lucious stacks, piles, mounds and sheafs of 'em--Ah! My lambs! I could eulogize the pious and high minded contributors for hours on end. Come on! Kick in. Deuces, treys and the one eyed jacks are wild. AFTER ALL--school is here 'n I've gotta cold 'n I'm bored 'n I bet there aint a good lookin' woman in any of my classes 'n altogether too many people have told me that the game Saturday was Ripon, quite so old chap, rippin' no end, 'n if the beggar on the (no love--NOT the adjacent desk) desk down the aisle does not stop whistling through his teeth I'm going to wrap me tried and true Underwood lovingly about his slightly unwashed neck 'n what boots it all Algernon? what boots it? Huh? ALLUS did like heroes. The guy that waved the fan for Cleopatra when she really got interested in doing her stuff. The sentry on the wall of troy that had to keep his mind on the job while Fair Helen prowled like an alley cat with indigestion. There was some good men. Some darn good men. But Lady they was amateurs! Have you seen Al Reiwitch? The great big, handsome--Greek God--who is toddling around Stagg Field of late? The other day Al got his nose stepped on. That great--big--handsome Greek--nose. Yeah. And he went right back 'n played football. Yeah, Theresa man! AFTER all -- she IS your girl!"